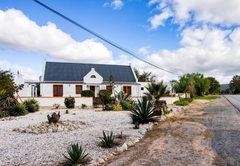 The Lady Grey Walk Cottage is a property providing self catering in McGregor for up to 8 guests visiting the Breede River Valley region. 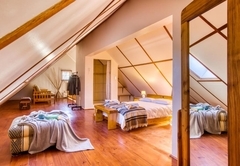 Escape to The Lady Grey Walk, a Cape Hollands cottage located in a quiet village of McGregor (which was once upon a time called Lady Grey) where time is just an illusion. Surrounded by mountains, vineyards and peacefulness, this is your home away from home. 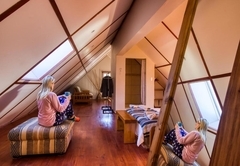 The Lady Grey Walk Cottage has two bedrooms downstairs and a comfortable mezzanine level with a bathroom, bedroom and living space. There are three bathrooms in total; one full and two en-suite. Bed linen and towels are provided. 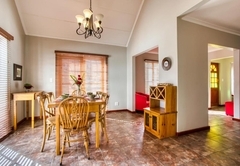 The self catering cottage has a fully fitted kitchen as well as braai facilities. 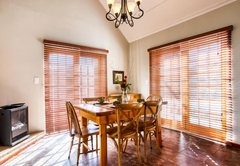 The quiet courtyard is ideal for a peaceful breakfast and wonderful mountain views can be enjoyed from the verandah which stretches right around the cottage. 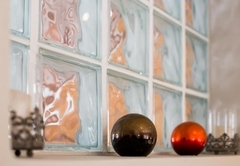 Our cottage is pet and children friendly and can occupy up to eight guests. Garage parking is provided. 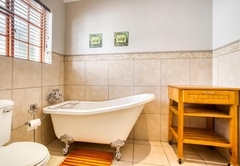 The Lady Grey walk cottage offers 2 bedrooms downstairs and comfortable mezzanine (bathroom, bedroom and living space for the young and independent ),1 full and 2 en-suite bathrooms, fully fitted kitchen, automated garage, verandah with outside fireplace. 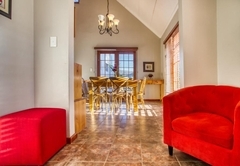 Response timeThe Lady Grey Walk Cottage typically responds to requests in 5-10 minutes.